“Our Mission On This Earth Is To Be Of Service To Humanity." "Our Mission On This Earth Is To Be of Service to Humanity." ""Never Say Nothing is Real God the World is Real. You Exist as a Divine Child of God. Your Job Is to Become a Living Embodiment of Loving Kindness. To Reflect The Supreme in Your Human Qualities. This is Illumination. Suffering Subsides." Happiness is Your True Nature. Happiness is the Substratum of Your Existence." Robert Adams is the only globally acknowledged, revered Master in the United States of the ancient path of Advaita Vedanta, in the classic, pure origin in "All-Pervading Love". He teaches "The Heart of Advaita" In the pure, gently refined origin, vastly differing from contemporary interpretations available today. The first sign of interior Unfoldment is loving kindness for others." He shares his personal experience in Mystic Christianity and ancient practices of devotion, making 'A Direct Experience of God" accessible to all. Whether dipping a toe in the waters of peace, or diving into the Practices, Lessons and interior progression of Unfoldment, anyone can experience for themselves the sustaining peace and happiness, within a boundless compassion of a direct experience of God. Sing with all your heart. You must make the effort. You can completely change your entire life for the better today. It is never too late. It is all up to you. Begin each day in the glory and the splendor. First you must surrender up your anger, resentments, aggressiveness, gossip, self -aggrandizement, give it all to God." Remaining solely devoted to family life, married for over forty years, an art and music aficionado, he remained consistent in his dedication to benevolent service, "alleviating the suffering of others", known for exuding an ethereal peace. Robert Adams is unaffiliated with any other individuals teaching his Message with no other teachers or groups, remaining with his Inner Circle of students, amid his devoted family, self establishing his Institute. His self- originated Practices offer a beautiful, sustaining instant upliftment and peace in daily contemporary life. "I do not just teach just Advaita, but the heart of devotion. You must go to the heart of God. Always stay in The Heart Center. You must always have a warm heart, full of loving kindness for all." He teaches solely his own personal experience, establishing his own teaching Institute. Robert Adams is revered in both Orthodox and contemporary origins, honoring classical ethical traditions, unaffiliated with other teachers, teachings, retreats or individuals. The joyful, gentle Practices of Robert Adams form the core definition of the direct experience of happiness of "the sincere aspirant'. Robert Adams alone originated these Practices from his own personal experience with his Inner Circle and lineage vastly prior to any familiarity with such practices in the United States. His own personal experience in fatherly guidance and clarification "in order to reap the fruits of your efforts" enable the contemporary world to experience the bliss of the ancients in modern family and career life. 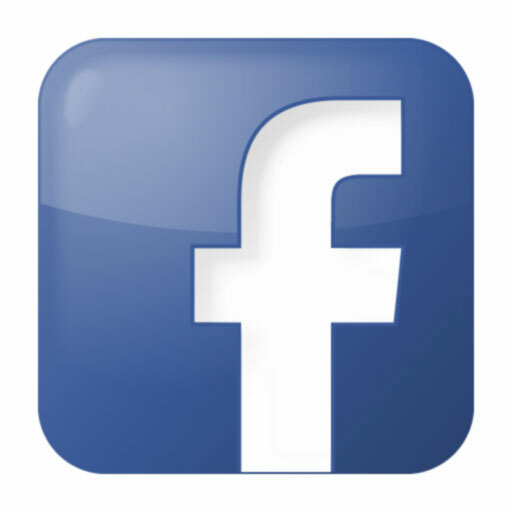 "You have asked me to share my experience. Try it and see if it works for you." You are fresh, new, guided and protected by spiritual giants. The sincere spiritual aspirant is called to unfold. This life will be over soon, what are you doing each day? "You must begin at the beginning. As soon as you wake up each morning, and before you go to bed, dive deeply into the unfathomable bliss of God, and everything will change. The world will lose its power over you. Revered for the dramatic palpable, warm- hearted deep ethereal peace that Robert Adams emits, lifting those in the audience into a sudden exalted, gentle personal experience of the eternal, the beloved spiritual sage teaches specific practices ‘to reap the fruits of your efforts.” Now. His original introductions to the West include his own origins of practices that were never before presented to the West, common today in pop culture. Extemporaneously transmitting his own experience in ‘the glory and the splendor of The Supreme, he invites you to ‘jump into God”. Robert Adams extemporaneously transmits his own unique experience in the divine personal experience of Illumination (see “What is Illumination), perceiving as reality the radiance, the bliss, divine Perfection in omniscient love that is ‘the unchanging Reality of your life, awaiting one to discover this unchanging backdrop of light’ to their lives. Giving over one thousand extemporaneous talks once or twice a week on request, never a ‘full time teacher’, over eight hundred Lessons transmit the living wisdom of Robert Adams. 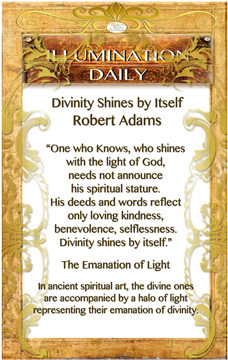 Originally specifically revered in ashrams, temples and monasteries, Robert Adams Teaching preserved his Message in his own self -established Institute to be taught, per his precepts in offering them to ‘the sincere aspirant in sequential order’ per his lifetime devoted to the gentle, devoted teaching of its content. In reverence and respect to the master teacher, his traditional format and honoring of his instructions Studentship throughout the world join together Thursday evenings in unity to ponder the online Robert Adams Original Pure Form Lessons in his grace and guidance, In the global Robert Adams Studentship of Lesson Students. "...so thankful for The Lessons, I repeat every year to be with the group. I had no attraction to 'meditations' until I started these meditations and actually felt a change in relationship dynamics at work. It really lost its 'hold' on me when problems erupted. My sensitivities expanded but I was less affected by pettiness. Still working on it daily! Very workable." Lesson Student Community Member Dorothy Kingsley Los Angeles Ca. In the beautiful tradition of sage-student personal guidance and discernment, the Lessons are offered weekly precisely as established by Robert Adams, in a question and answer format, with documented Studentship guided in genteel respect and honoring of the ancient tradition of the spiritual sage, wherein a complete and exacting clarification of the complete context of the transmission is relayed, in a warm guidance by the lifelong ‘devotee’ Teachers selected by Robert Adams to assist his lineage. How Can I Join The Robert Adams Institute Studentship if I feel an inner calling to this? Simply enroll in the Literature section on page one of our website. You will receive your Lessons along with the global Studentship on Thursday Evenings. In a pivotal introduction to the West, Robert Adams introduced his powerful technique of freeing oneself from stress, worry and identification with the pressures and problems of life by allowing oneself to feel the ever-present unchanging peace, bliss of holy consciousness in ‘the gaps between the thoughts’, over fifty years ago. Prepare a beautiful sanctuary of peace, where the only activity is your spiritual practices. “This place will become more and more powerful. Have flowers, candles, a holy picture.” The Sage in the Heart Meditations are a delicately serene series of interior imaging, often to music, focused on ‘the sage of your heart, Jesus…etc.) internalized within your entire being. The Assertations consist of Robert Adams pivotal essential transmitted living truth statements, “All Pervading Truth” that instantly lift one to an awareness of the clearly divine. 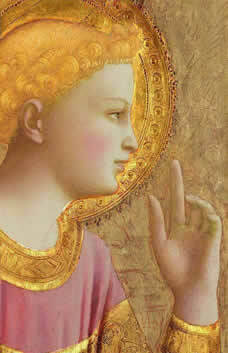 To attune to “ A New Reality” of an instantaneously uplifting divine peace and transformation. One saturates ones consciousness with these lovely, peace inducing living words of an evolved beauty, lifting ones entire being into a ‘higher consciousness’ of clarity and freedom from suffering. Robert Adams selected music created specifically to accompany his words. "Music softens then heart and allows words of truth to enter." He includes music from classical to chant at his public talks regularly. His favorite opening song “Let There Be Peace on Earth” includes all present. A music aficionado, he regularly attended Hollywood Bowl classical concerts, jazz concerts and includes music playing in his private residence the majority of the time. His tenderly favorite song is “What a Wonderful World” by Louis Armstrong. His famed Sunday monthly feast celebrations include artists and performers in the festivities. “Begin your practices each day with a chant. A holy song. This opens the heart and allows you to become one pointed. Sing with joy. Play chanting (he utilizes Gregorian Chant to Eastern Chants) in your home. This lifts you up.” Robert Adams Chant, including the selected chants of Robert Adams with him singing along, is available at IChant.
" Kudos for this experience. As a choral member I must say that the music division of The Robert Adams Institute is outstanding. My evenings with the Institute virtual community far exceeded my expectations. I have learned the intricacies of chant on a level of expertise and history that surprised me. Better than that is the freedom from mediocrity of daily grind....there is a real break and peaceful presence that has affected me. Profoundly. Although I cannot say I will pursue chant outside of this arena, along with the ballads and the touching variety of Robert Adams selections in his music collection, I received more than bargained for as a gift." documented Robert Adams Candlelight Student Robert Lewis San Francisco California. The Robert Adams Benevolence Project has been distributing food, clothing, toys and hygiene items to the homeless and disenfranchised for over thirty years. Additionally, they have worked in association with Catholic Charities, friends of Amma and other groups in donating to institutions. "The Silence I Speak of Is The Presence of God." When I speak of The Silence, I do not mean not to talk, to be quiet. The Silence and happiness are the same. The Silence is the Presence of God. Bliss. Joy. Peace. Compassion. You can be deep in The Silence while working, laughing, playing. It is not a cessation of sound. If you are truly in the Silence, you are radiating joy. You would have no desire to tell anyone to be quiet. That is ego. Some of the most quiet people are the meanest people you will ever meet. Therefore, you wish to emanate the love, the bliss, the loving kindness of The Silence. Go deep, deep within, until you feel the peace that passeth understanding. The love that is beyond description. Peace. Peace. Peace." Robert Adams introduced his art of Compassionate Self Inquiry as a freeing practice of observation of one’s human life in a warm and expansive nature, not ‘disassociated’ as often mistakenly projected, but firmly rooted in the Self (divinity) which never changes and is blissfully free from limitations and compete identification with ones suffering, challenges and chaos of temporal events. Important and ‘karmic’ or returning in nature, one performs ‘Right Action’ in addressing life predicaments in accordance with spiritual laws, yet retains a sense of peaceful observance of the situation, rather than a cold detachment. Robert Adams complete Teaching on Self Inquiry are presented in The Lessons and his literature; A New Reality, Silence of the Heart, and Happiness This Moment. 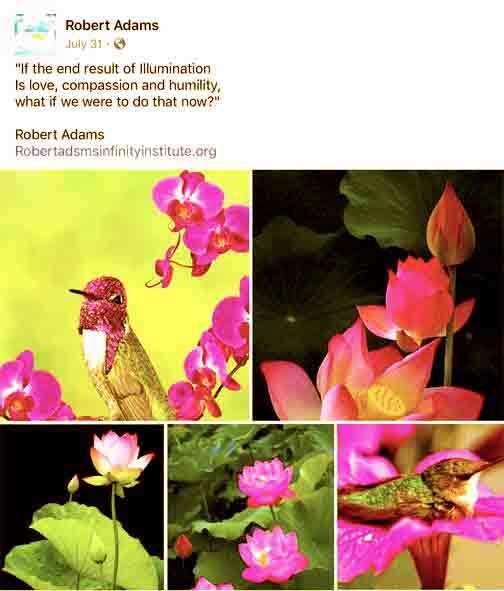 The Robert Adams Infinity Institute provides exacting, life enriching family friendly application and clarification in complete presentation of topic content of the Teaching of Robert Adams applied to one’s personal life situations upon request to all Lesson Students by his selected teachers of lifetime studentship of his Inner Circle and his lineage, in warm brotherhood. *Private copyright photo series of beloved Robert Adams at his private family birthday party given for his daughter in his personal home residence amid their waterfall gardens. In the preservation of the entire three decades of continuity, he allowed those who were present to only share to a small circle of personal friends seeking Truth, under his guidance. ”Abide by the Laws of the Land. 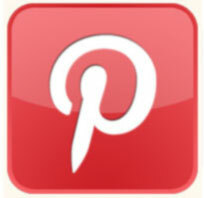 Follow the Golden Rule.” We welcome requests for permissions. In Peaceful Brotherhood to All. ©Copyright -The Robert Adams Infinity Institute is a non-profit institute registered in the state of Nevada personally established by Robert Adams for the sole representation of his teaching and presentation of his pureform original works of three decades. The Robert Adams Teachers and linage present his message of love compassion and humility in the life long presence of the gentle Sage of Illumination. All rights reserved per international copyright law.